I would like to add an author’s note here. This post was written before the controversy around 19 Kids and Counting, before we knew that Josh Duggar had victimized his sisters and other young girls, before his hypocrisy in condemning homosexual couples paired with him soliciting extramarital affairs. I could take this post down, but I still feel a connection to the idea that we sometimes punish ourselves with TV shows and Instagram accounts and celebrity reality shows, taunting ourselves with what we can’t have. For the record, I did seem to think they were doing a good job raising children and am currently shaking my head realizing that all I knew was an highly edited version of their lives-not what really went on. I used to watch 19 Kids and Counting each afternoon when I exercised at our local rec center. And by “used to” I mean I watched it daily up until a week ago. The Duggars kind of fascinate me. Obviously, their life is very different from mine. Rural Arkansas and its lack of diversity is a different world from the suburbs of Chicago, and as a one-time public school teacher I don’t really agree that homeschooling is the way to go, and I generally wear pants and low-cut tops whenever I feel like it, modesty be damned. Their Christianity doesn’t resemble mine, especially when I mix it with Buddhism or scientific inquiry. Oh, and I have seventeen less children than the Duggars do. They seem to be good parents. I understand how reality shows can be edited, but from what I can see they instruct their children with patience and love. They seem to be thoughtful about how to foster good relationships and how they instill values like kindness and respect and purpose into their offspring. I quietly cheer them on when I hear more kids or grandkids are on the way. These are people who want children, see them as a blessing and seem to know how to raise them to be decent human beings. I got to see babies and cuddle them vicariously as my own got older and older. I got to see how excited these women were to find themselves pregnant again. I had to stop watching this show. Watching it was a way of punishing myself, flooding myself with images of a chapter of my life that is closing. It is unlikely, very unlikely, that I will be having any more babies. Having fibromyalgia is difficult with two fairly independent children; I cannot imagine how much pain I would be in going back to newborn days when sleep deprivation goes on for months and months. And, according to some blood tests, the chance of me even becoming pregnant again is very low- as low as it would be for a woman ten or fifteen years older. I have been intensely angry at my body, though I hadn’t realized it. I have quietly and persistently been furious with my body for all of the things it cannot do. I am angry when I can’t play at the playground with my kids or take them to the pool, when at a fun run I am even slower than a three-year-old and a woman who is recovering from surgery, when I can’t stay up late without major consequences. I am furious at what I can’t have: the shoes I can’t wear because they jar my spine, the food I can’t eat because it makes pain run up and down my arms, the plans I have to cancel because I cannot do one more thing. The babies I can’t have. Not that I was planning on having more anyways. Watching the off-the-charts fertility of the Duggars was a super subtle way of admonishing my body, reminding it of its shortcomings. That I watched it while exercising, which I don’t want to do but I have to do every day so I don’t feel even sicker, was the sneakiest way ever to be mean to myself. 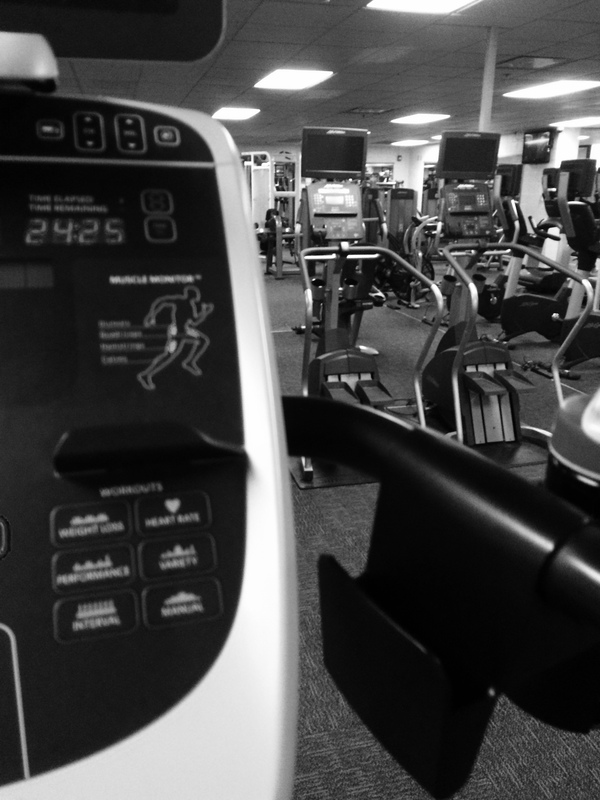 It’s a small turning point, one that would be invisible to the people who see me on the elliptical machine every afternoon, but I think it’s an important one. And so far my body seems relieved that the activity I put it through every day isn’t rooted in so much anger and disappointment. It feels happier.